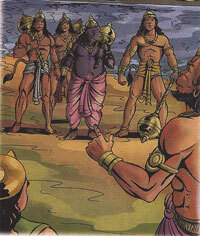 Was the great Bear king, the powerful but sagely Jambavan. He made service of the King Rama as his life’s Dharma. By reminding Hanuman how mighty he really was- and capable. He ensured the recovery of Sri Laxman- this wondrous bear. During both Rama and Krishna Avatar.